Despite the positive reports of UK’s GDP, GBP was not supported. Taking a long term look, the pair is moving with less volatility creating lower highs and higher lows. The support rests at 1.24170 with resistance at 1.24690 which the weekly pivot point at 1.24450 is located in between the lines. The EMA of 10 is moving with bearish bias and it is below the EMA of 200 and the EMA of 100. The RSI is moving horizontally on the 50 level, the Stochastic is showing upward momentum and the MACD indicator is in negative territory. The ADX is not showing any clear signals. 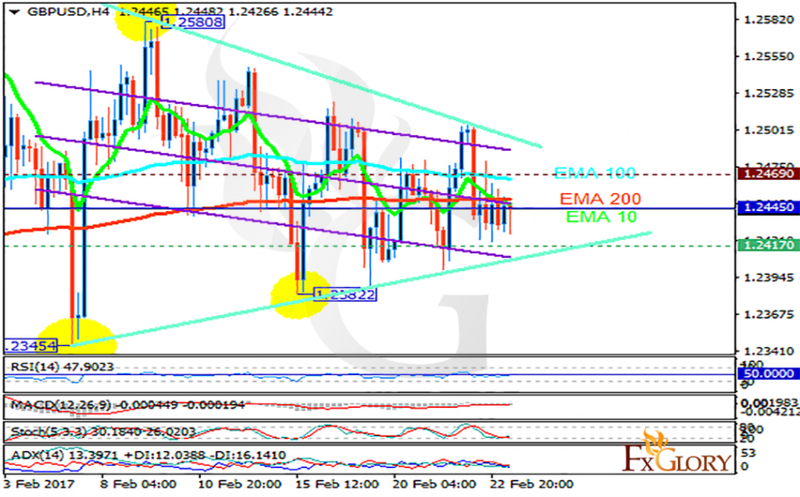 The support level breakthrough will be a good sign for sellers to target 1.2350.